TMZ, the gray is out of Sugar Cain and Zelda, a 34 inch zebu cow. This guy was only 18 inches and 23 lbs. He is solid as a rock, born April 7th. He is thick, deep and looking good. He has darkened up and has brindle. We will keep him to see how he grows out. Herd sire potential. Woody, the red bull calf is out of Sugar Plum, one of my best cows. She has had two great heifers, now a good looking bull. He is out of our 30 inch bull. He is solid. He is filling out, hopefully he stays small. Another herd sire in-waiting. He was out of our 29inch red bull. He was born April 30th, 20 inches/23lbs. We will keep and watch him grow out. Herd sire potential. Choncho,wow. That is all I can say, wow! 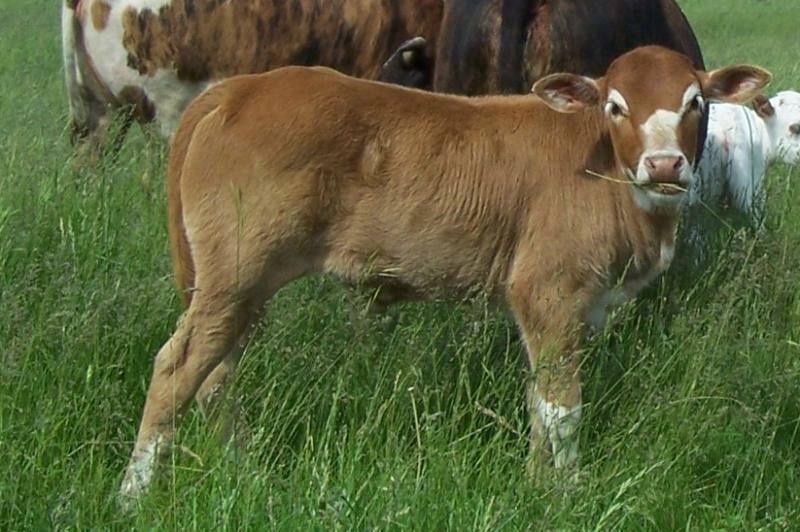 A fancy colored bull calf that is a bay and white lineback. He may eventually brindle up. He was born June 22nd, 21inches/28 lbs out of Sugar Bottom( a Sugar Plum daughter) by Rascal, our 29 inch bull. He is awesome. It will be fun to watch him grow. We will keep him back for a potential herd sire. Tyson's TKO is another good one. If you are going to have bull calves, at least have good ones. This guy has herd sire potential. we will keep him back to see how he finishes out. His mother is only 33 inches tall and his sire is 29inches. White with brindle speckles and spots. Born July 6th, 22in/21lbs. We will keep him back and watch him grow. Herd sire potential.